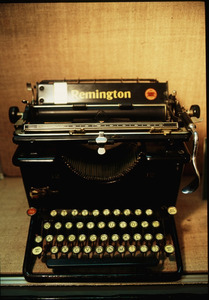 Remington model typewriter used by William Faulkner while working and writing at the University of Virginia. 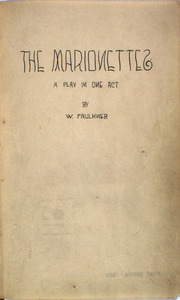 In 1920 William Faulkner while a student at the University of Mississippi wrote this one-act play for a drama club called "The Marionettes" of which he was a member. The play was never staged, but Faulkner hand-lettered, illustrated, and bound six copies. 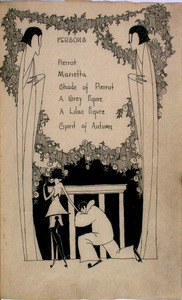 The illustrations are in the Art Nouveau style reminiscent of Aubrey Beardsley. 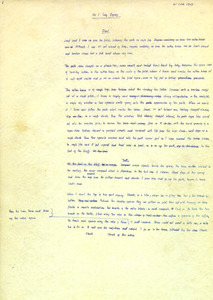 The University of Virginia’s copy is one that was given by Faulkner to his friend, Ben Wasson, whose ownership signature is on the first blank leaf. "I set out deliberately to write a tour-de-force. Before I ever put pen to paper and set down the first words I knew what the last word would be...Before I began I said, I am going to write a book by which, at a pinch, I can stand or fall if I never touch ink again."